Convent of the Visitation School in Mendota Heights, MN, has a special relationship with the Visitation Monastery of Minneapolis. They are two Salesian communities within 15 miles of each other. The students respect the Minneapolis Sisters, and the Sisters appreciate the School’s holiday gifts for their neighbors. But their relationship goes deeper: together, the communities inspire love for God by inspiring love between diverse people. With their inner-city monastery, the Minneapolis Sisters change the way the students engage with the world. Last February, I had the privilege of interviewing four Visitation high school seniors: Sarah Koury, Mary Kenny, Bridget Hayes, and Jules Staelgraeve. It was the middle of the semester, a relentlessly stressful time, and yet there they were, taking time to talk with me about the Visitation Sisters of North Minneapolis. It was profoundly apparent that interacting with the Sisters and their North Minneapolis neighbors had changed the students: they had become more comfortable with people who are different from them, and they had learned to appreciate the importance of relationships. Working with people who are different from us is challenging: it takes patience, inner strength, and empathy. It is so easy to avoid a situation that would require it! But the Sisters give the students an opportunity, and the students have embraced it. 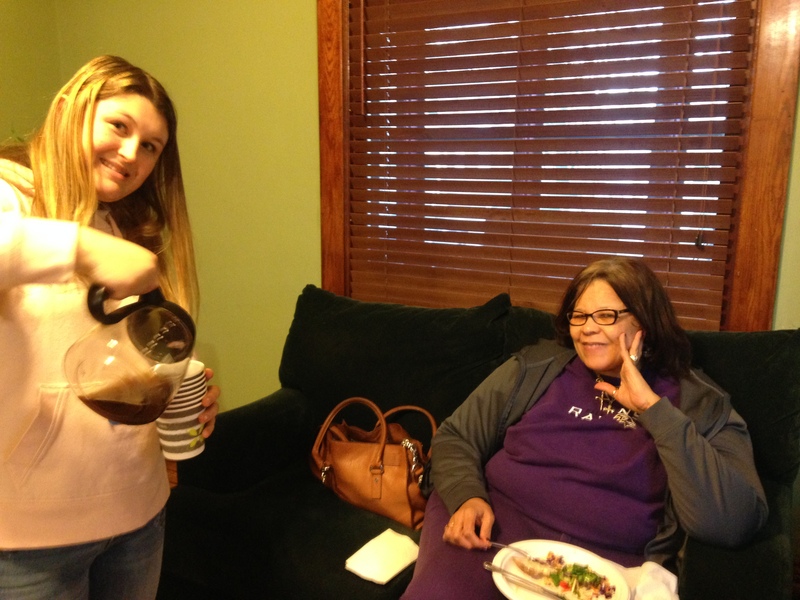 Mary committed a week to the annual Visitation mission trip, and she appreciated it so much that Sister Suzanne invited her to North Minneapolis afterwards. 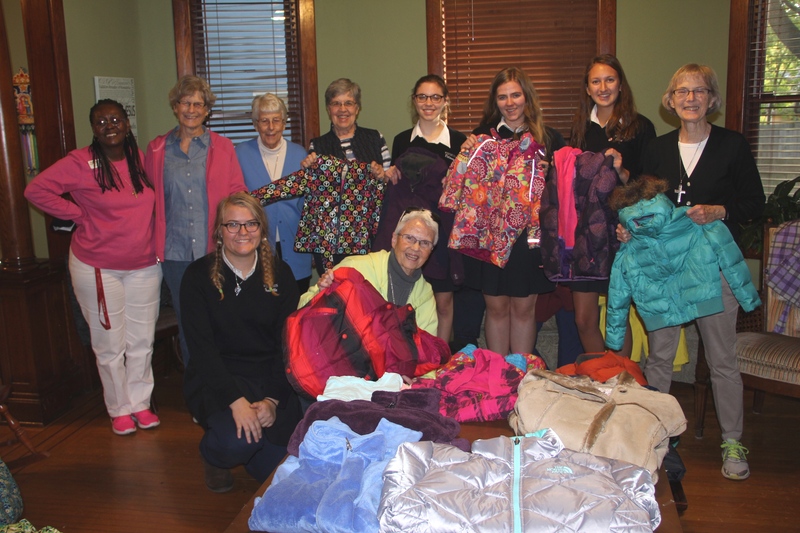 Initially, Mary was intimidated by the neighborhood’s reputation, but the guidance of the Sisters transformed her perception, and she returned eagerly to help with the Thanksgiving food delivery, the winter coat drive, and the Christmas stocking drop-off. Jules was also at the Thanksgiving food delivery, as well as the Halloween and Christmas parties. The influence of the Sisters became apparent after she left: she realized she was suddenly more accepting. She works with people of diverse ethnicities, where no one looks like her, and she noticed that it was easier to talk them because of what she had learned from the Sisters. For Sarah, talking with North Minneapolis neighbors about their lives made her recognize her own comfortable lifestyle for what it is. Now, when she hears her classmates stress out about homework, she appreciates how fortunate they are not to be stressing out about survival. Bridget witnessed the importance of recognizing and responding to others’ needs. She saw how the Sisters engaged with children on Halloween, inviting them out of the cold to sing songs when they had only asked for candy. She emulated their actions as a volunteer at Jeremiah House, a support program for single mothers, recognizing the needs of the moms beyond her explicit duties and delivering wholeheartedly, just like she saw the Sisters do. These stories are a small peek at the transformation that Visitation School and the Visitation Sisters are instigating together. It started with a week-long high school mission trip. A Christmas party. A food delivery. It has turned into a bridge across cultural boundaries. The transformation continues. Understanding and serving diverse people is a stepping stone to the core feature of the Sisters’ presence in North Minneapolis: forming a loving bond with their neighbors. The Visitation students have learned this precious art of building a relationship. At Sarah’s first service project, a Salesian Monday Night meeting, she walked into Girard House and instantly felt at home. The house was humming with conversation and laughter, and she was shocked about how instantly the community accepted her, a stranger. She felt like she was participating in the event, not volunteering for it. She filled some water glasses but otherwise spent the evening chatting away. She realized that this was the deeper meaning of “service”: participating in community. Jules treasures a memory of the Sisters’ Christmas party for children, where she didn’t think much was going on, but the children were having the time of their lives. All she did was read them stories, introduce them to Santa, and pray with them. Apparently, these small displays of warmth were enough to inspire the joy of Christmas. Bridget learned not only how to make people feel comfortable but also how to appreciate when someone else comforted her. She admired how the Sisters invited friends inside, sat them on the couch, and fed them, and she recognized the same openhearted generosity in a friend’s mom who, just like the Sisters, welcomed Bridget into her home. Bridget experienced a new sense of gratitude. Mary was pleasantly surprised to encounter generosity from grocery stores who were more than willing to donate discounted turkeys to the Visitation turkey drive. Her eyes were opened to the potential for engagement with the wider community. These stories speak to the Visitation School motto: Non Scholae, Sed Vitae (Not for School, but for Life). It reminds students that life is about more than books and exams. The Visitation Sisters of Minneapolis have made this motto a reality by teaching the students to embrace the lifelong virtues of community and love. Listening to these stories, I realized that the Minneapolis Sisters had transformed how the students relate to other people by transforming who they were as individuals. Sarah is a beautiful example. Her experiences with the Sisters changed her faith and who she wants to be. She prays more. She is more modest about how she dresses and what she posts on Facebook. Her faith is spilling over into her community, inspiring her family, her classmates, and even the little girl she nannies. She says that the Sisters and their neighbors helped her rebuild herself into someone she wants to be. She now lives a life more devoted to God and to service. The Minneapolis Sisters inspire goodness in the students, who then embrace a vision of love for their diverse community.